Q.Do you know the name of George Washington's horse at Valley Forge? 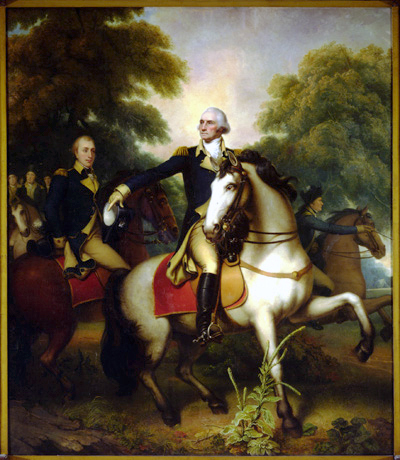 A.Washington had several horses throughout the war. Two of these were named "Nelson" and "Blueskin." both of whom served Washington throughout the War. Valley Forge, December 30, 1777. My Lord: The bearer presents the horse to you which I offered in exchange for your black. In the summer when I first got him, he had the appearance of a fine, and handsome horse; at present (by neglect of Bethlehem) his appearance is altered. He was purchased for me by Col. Moylan as a horse of Six yrs old, and I believe him to be sound, knowing nothing to the contrary. He goes rough equal I believe to your black, and has no bad qualities that I know of; however, as I have no opportunity of sending the black to my home at present, your Lordship may try the other, and judge from the experiment of eligibility of the swap. In the mean time yours may, or may not, as you choose it, stand in my stable; as I design him for no other purpose than a stud horse for the use of my Mares in Virg'a. I am, etc. My dear Sir: In what terms can I sufficiently thank you for your polite attention to me, and agreeable present? and, which is still more to the purpose, with what propriety can I deprive you of a valuable, and favourite Horse? You have pressed me once, nay twice, to accept him as a gift; as a proof of my sincere attachment to, and friendship for you, I obey, with this assurance, that from none but a Gentn. For whom I have the highest regard, would I do this, notwithstanding the distressed situation I have been for want of one. "When dinner was over, we visited the General's stables, saw his magnificent horses, among them "Old Nelson," now twenty-two years of age, that carried the General almost always during the war. "Blueskin," another fine old horse, next to him, had that honor. They had heard the roaring of many a cannon in their time. "Blueskin" was not the favorite on account of his not standing fire so well as venerable "Old Nelson." The General makes no manner of use of them now. He keeps them in a nice stable, where they feed away at their ease for their past services.'" Interested in using our content? Click here!